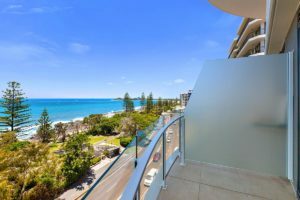 This Mooloolaba resort accommodation will definitely turn your head. Have you ever seen anything like it? And you’re not likely to for a long time either. This is the Sunshine Coast holiday accommodation of your dreams. It’s all 100% Sunshine Coast, right down to the balconies, because you see, each floor has a unique footprint, designed to allow maximum sunshine and light into the apartments without compromising that of your neighbours above or below you. The Breeze Mooloolaba resort hasn’t just been designed to look good. It’s been designed for living. Living on the Sunshine Coast to be exact. With Mooloolaba Beach directly in front of the resort and the Mooloolaba Esplanade inviting you to follow the pathway in front of the beach. There are adventures to be had in each direction. Take advantage of the local fresh seafood for sale at the Mooloolaba Spit and cook up a storm. 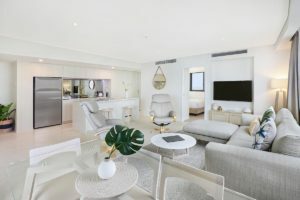 Choose from a range of one, two and three bedroom apartments conveniently located just minutes from the patrolled beach, restaurants, cafes, bars and boutique shops that line the Esplanade. The other way is Maroochydore. In-between is Alexandra Headland, great for the advanced surfer. And in-between Alex Headland and Mooloolaba is the HMAS Brisbane lookout. Two and a half kilometres out to sea is the sunken HMAS Brisbane. Now an artificial reef for divers to explore. Fancy a dive? You can entertain the family with plenty of activities and adventures to fill your days with, exciting trips and tours that the whole family can enjoy together. The whole family will love visiting Underwater World Sealife or Australia Zoo. Get up close and personal with a wide range of animals and their habitats. 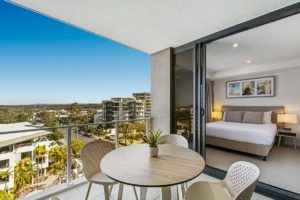 Your next holiday spent at this Mooloolaba resort accommodation will be one to remember when you stay at The Breeze. Book your holiday. Today.